This is a story of Paige who has had a bloody rough time of it. Her husband has been a complete jerk, she suffered the loss of a child, post-partem depression and is recovering from a stroke. She decides to get away with the two people she loves most; Alice, the closest thing she has to her mother and Matilda, her rambunctious daughter. An old photo decides the location for the adventure and the trio of women embark on a trip to the country. The further Paige distances herself from her problems, the closer she comes to unravelling a family secret which was never meant to be found. My go-to books are thrillers, suspense, and dystopian. Season of Shadow and Light is not my usual bag and it showed me that it’s a good thing to delve into other genres from time to time. The slow burn suspense and the detail in locations work together with the thoughtful building of each character, creating a read which hooked me in tight. I have found this is the third book I have read for review in as many months which deals with post-natal depression and women’s mental health. I hope this paves the way for more interesting books which do not shy away from mental issues or that of sexuality, life choices and relationships which are not all roses and light. We are no longer in the Mills & Boon age, and I think us bookworms are far better for it! Season of Shadow and Light delivers suspense, secrets, romance (without the cliches), stunning Australian countryside, mental issues, sexuality, small town traits, handsome chef’s and strong, independent women. 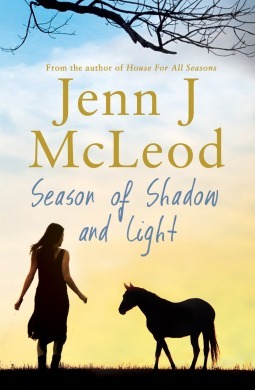 A pleasant surprise which will lead me to search out Jenn J McLeod books for a regular read! Sign into Goodreads to see if any of your friends have read Season of Shadow and Light.